NORWICH: Its cobble streets and historic quarters are full of independent retailers and are a pleasure to explore. Norwich is also gateway to the county of Norfolk whose tourism assets range from the waterways to the idyllic beaches of the north Norfolk coast. Picturesque coastal communities include Blakeney, Burnham Market, Cley and Wells-next-the-Sea. Several of Norfolk’s fine country estates including Holkham and Blickling Hall host open-air concerts and events in their grounds during the summer, ranging from classical Proms Nights to Ibiza-inspired dance parties. Check in. Close to the town of Holt and the north Norfolk coast, four-star The Pheasant Hotel has 30 bedrooms. Enjoy fresh local produce such as Cromer crabs and Kelling Estate pigeon in its restaurant or take afternoon tea in the light and airy new Orangery. An affordable choice set on the cliffs in the seaside town of Cromer, The Red Lion is a Victorian pub with 15 guest rooms. Inspiring Cathedral. The most complete Norman Cathedral in England, Norwich Cathedral is a fine example of Romanesque architecture. Discover the Cathedral’s 900-year-old history on a free tour lead by a volunteer guide. The most unusual guests is a pair of peregrine falcons who’ve made the Cathedral spire their summer home since 2009. Historic cobble streets. With more that 80 listed buildings including quaint Georgian properties overlooking a large green, the cobble streets surrounding Norwich Cathedral are known as The Close, and have provided a backdrop for television period dramas. With several independent shops, galleries and pavement cafés, the wider Cathedral Quarter is a delightful place for a leisurely stroll. Independent retailers. An area of great historical interest, The Norwich Lanes have an even bigger selection of independent retailers – so these pedestrianised lanes and alleyways are both fascinating and rewarding to explore. Dedicated shoppers will also want to visit the city’s five department stores, including the independent and historic Jarrold, plus the largest Marks & Spencer store outside of London’s Oxford Street. Enjoy lunch. There are many independent cafés, restaurants and pubs in the Norwich Lanes, but one recommendation is The Assembly House Dating from 1754, this Georgian gem in the city centre is owned by a registered arts charity. As well as being a venue for weddings and exhibitions, its glamorous dining room is perfect for lunch or afternoon tea. Castle and museum. One of Norwich’s most famous landmarks, the Normans built Norwich Castle over 900 years ago as a fortified royal palace for William the Conqueror. Today it’s known as Norwich Castle Museum & Art Gallery with a collection of fine art, archaeology and natural history. Man-made waterways. Head 20 minutes north-east of Norwich by car or public bus to the famous Norfolk Broads. Historians in the 1950s made an unexpected discovery about this network of over 200km of navigable waterways – namely, that it’s a man-made phenomenon dating back to medieval times. The village of Wroxham is considered the gateway to the Norfolk Broads. Broads Tours run popular river trips from here, typically lasting 1-2 hours. Drop anchor. While navigating the Norfolk Broads, enjoy a dinner in a waterside pub, many of which have mooring for boats as well as a car park. Set next to the beautiful Ranworth Broad, The Maltster is a family-run pub in a lovely setting. Or try the King’s Head or Rising Sun, both overlooking Coltishall Common. Breakfast. Located in the heart of the Georgian market town of Holt in north Norfolk, Byfords deli and café is a popular breakfast and Sunday brunch spot. Start the day with a breakfast pizza: an authentic thin crust pizza topped with all the classic full English breakfast ingredients. Or for real local flavour, try smoked kippers from the nearby Cley Smokehouse. Antique and vintage. The picturesque town of Holt owes its charm to an 18th-century disaster. A devastating fire in 1708 destroyed the timber buildings of medieval Holt in just three hours – but from the ashes rose the many fine Georgian buildings that characterise Holt today. Its streets are full of antique and bric-a-brac shops, galleries and restaurants. Railway to the coast. Travel through stunning heathland and coastal countryside onboard the North Norfolk Railway. These magnificent steam and diesel locomotives make the 20-minute journey between Holt and the seaside town of Sheringham on the north Norfolk coast. At Sheringham passengers may connect to mainline trains bound for Norwich. Michelin-star cuisine. Renowned chef Galton Blackiston has earned a Michelin star for his cooking at Morsden Hall near Blakeney, a country house boutique hotel that he owns and runs with his wife. He also owns No 1 Cromer in the seaside town of Cromer. Stunning beach. With its vast and unspoilt beaches, the North Norfolk coast is a great place to relax. Part of one of Britain’s largest National Nature Reserves, the beach at Holkham is wild and beautiful – and was recently voted ‘Best Beach In the UK’ in a survey of British travel writers. Backed by mature pinewoods, the stunning beach at Wells-next-the-Sea is known for its row of 200 colourful and photogenic beach huts. Royal house. 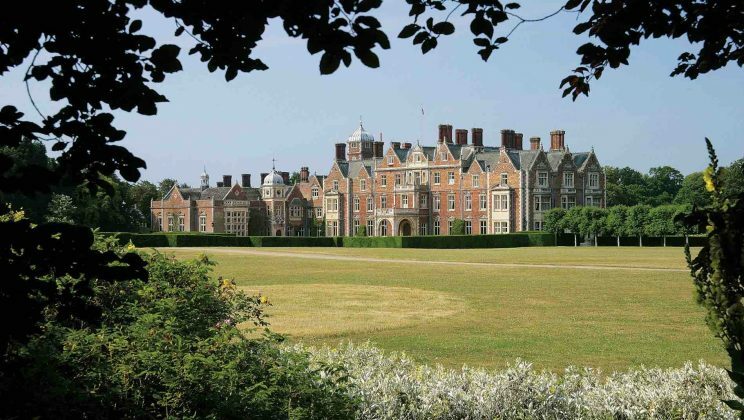 The much-loved country retreat of Her Majesty The Queen, Sandringham is one of Norfolk’s most famous stately homes. The house first opened to the public 40 years ago, at the Queen’s request in her Silver Jubilee year of 1977 – although its extensive gardens have been open to the public since 1908. Variety show. 2017 is the 40th anniversary year of the Cromer Pier Show the only ‘end-of-pier’ show in the world. Staging summer and winter seasons in the 510-capacity Pavilion Theatre on historic Cromer Pier, this live variety show features all kinds of talent. Behind the scenes tours can be arranged. Make it Happen. Norwich and Norfolk are in East Anglia on the east coast of England, two hours north-east of London by train. Norwich Airport is served by flights from British and European cities.